Home » Emma Bentham, Au.D. 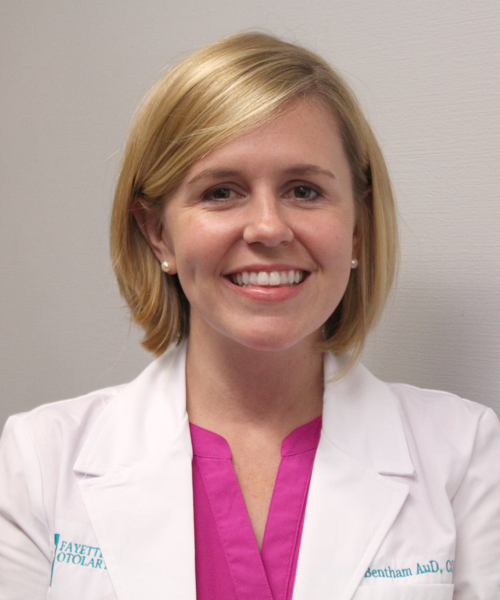 Emma Bentham is a native of Fayetteville, NC and joined Fayetteville Otolaryngology Head and Neck Surgery, P.A. as a Doctor of Audiology (Au.D.) in May of 2012. She earned her degree in Communication Disorders from Appalachian State University in 2008. Emma obtained her Au.D. degree from Auburn University in 2012 after completing rotations at the Atlanta VA Medical Center, and Pediatric Ear, Nose and Throat of Atlanta. She is a fellow member of the American Academy of Audiology, and holds a license as an audiologist in the state of North Carolina. Her interests include church, spending time at Holden Beach with family and singing.